Last week, I told you how my bathroom in my new house had no storage and so I made that cute Cloud Toilet Paper Holder, right? 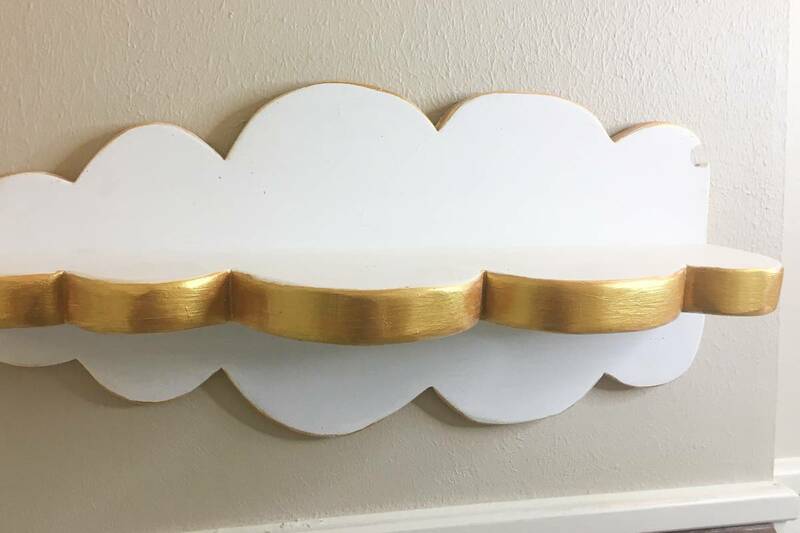 Well, I felt like it was a little out of place and needed something to help make it feel more “put together” in there…and so…I made a cloud shelf to hold tissues, lotion, whatever else I might want to have on a shelf! 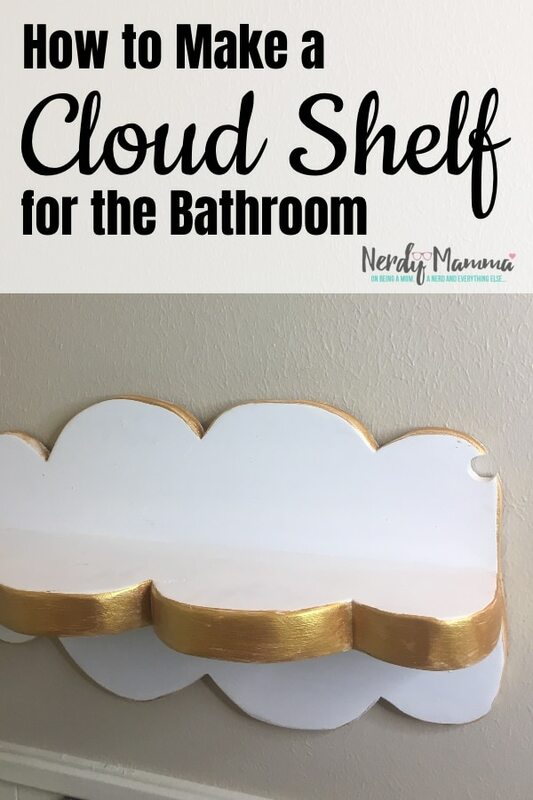 And, bonus, I decided to share with you How to Make a Cloud Shelf for the Bathroom so you can have a matching shelf for your cloud toilet paper holder too! 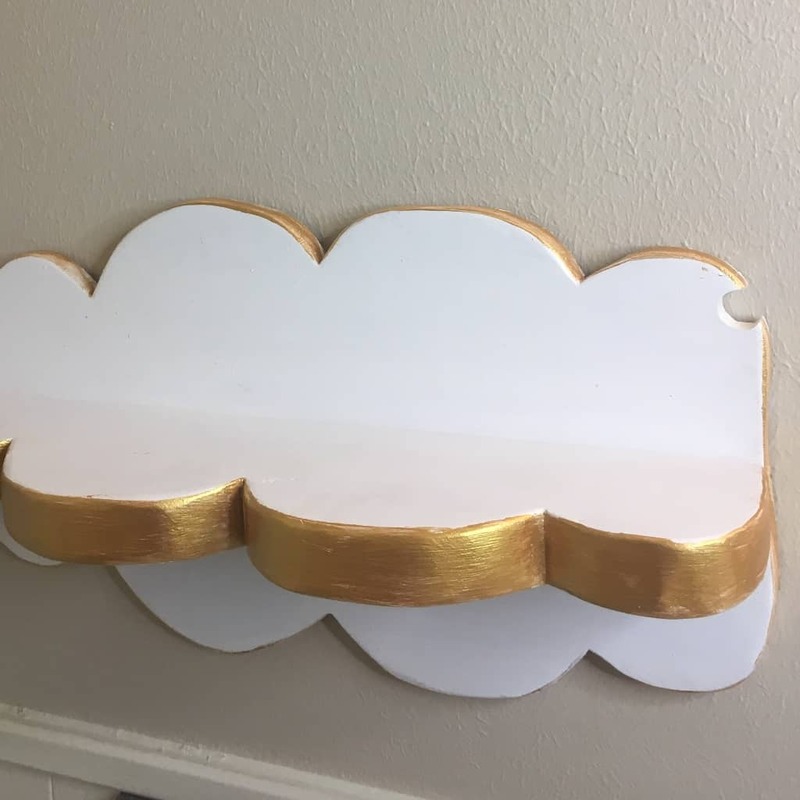 Now, like with the Cloud Toilet Paper Holder, I made a fun little YouTube video for this How to Make a Cloud Shelf tutorial. If you like it, be sure to subscribe to my channel and click the little bell so you’re reminded when a new video comes out! Using a bowl (or some other round thing of about 4-5-inch diameter), trace your round bubble nodules onto the piece of 2-ft long 1×8 board (the shelf). Cut out your shelf with the jigsaw. Sand the shelf on all sides. Lay your shelf onto the lower half of the 2×12 and trace the bubbly part of the shelf shape. Carefully flip the shelf to the top half of the 2×12 and trace the bubbly part of the shelf shape again. Stand the shelf on it’s flat side and trace the top and bottom of the flat face onto the 2×12 (the back piece) so that you know where the shelf is going to sit once affixed to the back piece. Using the jigsaw, cut out the bubbly shape of the back piece. Sand the back piece EXCEPT where you marked the shelf–don’t sand those marks away, you’re going to want them. With the superglue, attach the shelf to the space between the marks you made earlier. Make sure it’s straight and clean–exactly where you want it because it’s not going to be easy to move if you decide it’s not “right”. Flip the whole thing over once the glue has dried, and pre-drill, then screw the 3-inch long screws into the back piece, further securing the shelf to the back piece. Paint the front and shelf white. Allow the paint to dry and do a second coat, if necessary. Paint the edges of the cloud bubbles with the gold paint. Allow that paint to dry, also doing a second (or third coat) if necessary. Tie the string around the back piece, flush with the shelf, making a straight line at the top side of the shelf. Using the string as your base line, mark where your keyhole hangers will need to sit. Also mark where the screws will need to go so that you don’t accidentally drill those areas out. Drill using your small forstner bit (1/4-inch is what I used) the area you marked for the key hole hangers to sit. Make sure not to drill out the areas where the screws will need to be–and be careful not to go through your shelf. Pre-drill your screw holes then screw the keyhole hangers onto your shelf. Touch-up any paint scrapes made while putting the hangers on. Mount to the wall using anchors, being careful to get your shelf level. I didn’t get this filmed and I’m sorry for that–I tried but didn’t remember to hit “record”. But, basically, I colored my screwheads, the ones holding the keyhole hangers in place, with a marker (this works with a pencil too) then immediately mushed that against the wall while holding the level on my shelf. This marks the wall with dabs of marker where the screws are on your hangers–then you know you need a hole in between them. Then I predrilled a hole, pushed my anchors in, put their screws into the anchors, then put the shelf on. Add tissues or whatever to your shelf! Now, I say this, but I have had this in my bathroom now for about a week and I can’t find anything I really want to put up there…sooo…lol! Simple, right? And it looks so cool in the bathroom, seriously. If you loved this, be sure to pin it so you can build your own when you’ve got your keyhole hangers ordered. And don’t forget to subscribe to my YouTube channel and hit the bell so that you get notified when a new video comes out!